Rather than dumping in everything from your beauty cupboard into your make up bag here are some tips on how to pack the perfect cosmetic case. 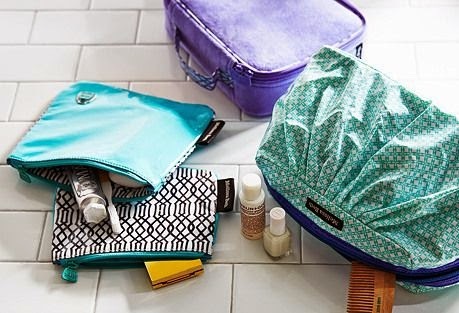 Divide your make up case into sections (or buy one that has great compartments). Keep like things together, (eye shadows, brushes, moisturizers). It will make finding things easier when you are searching for something. To prevent your eyeshadow quad or bronzer from shattering, add few makeup sponges for padding to the compartment when you place your shadows. The inside clear compartments of the Kiss and Make up are a perfect place for this. Make sure you pack your brushes in a brush holder or a zippered case so the ends don't get bent. The brushes are so expensive so it pays to 'make nice'. Don't be a loony-toon or be in denial. It's obvious that at some point in your toothpaste will explore while traveling or your favorite blush will shatter to pieces. Be proactive, make your life easier and make sure your cosmetic case is WIPEABLE an easy to clean. A laminated inside lining will make you laugh off any major explosion that happens en route.